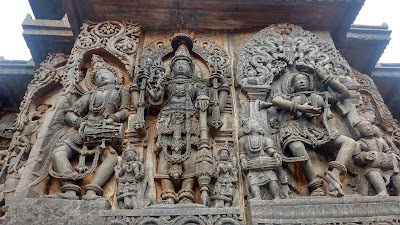 The Hoysala Dynasty originated in the Malanadu region of Karnataka around the turn of the 12th century and spread out through the state, their backs protected by the mighty wall of the Western Ghats. 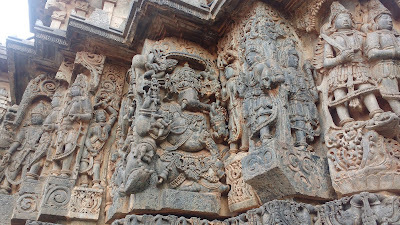 The term Hoysala literally means lion-slayer. It originates from their first victory over the Tamil Cholas - their emblem was the lion - at Talakadu. The dynasty came to an early end in the middle of the 14th century, but by then, had left a lasting imprint on the state's architecture. 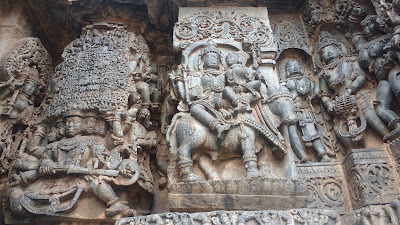 The intricacy of Hoysala black soap-stone sculptures is virtually unparalleled in the country. 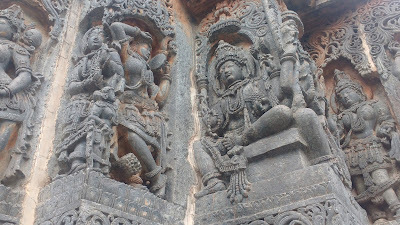 There are three prime centres for Hoysala architecture: Belur, Halebidu and Somnathpura. 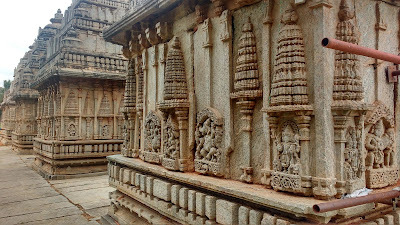 The three prime centres of Hoysala architecture and a few others are located conveniently near Mysuru and can be covered in a couple of days with a dedicated transport. The bus connectivity for these places is not the best since they are located rather far from main cities and highways. A rented car or bike from Mysuru would be the best bet. The loop covering the main places as shown in the map equals a distance greater than 400kms. Somnathapura is located about 35km south-east of Mysuru. 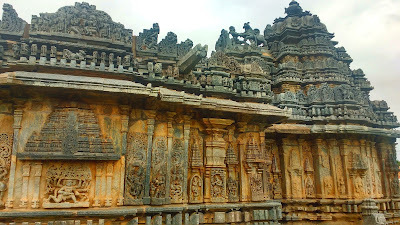 Halebidu is located about 150kms north from Mysuru and 35kms north-west of Hassan. 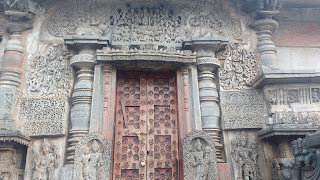 Belur is located 15kms west of Halebidu. 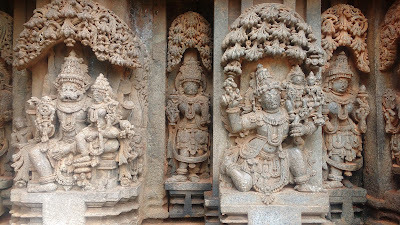 Kikkeri and Govindanahalli are small diversions on the route between Mysuru and Halebidu, near Krishnarajapete. Korvangla lies a little to the east of Hassan. 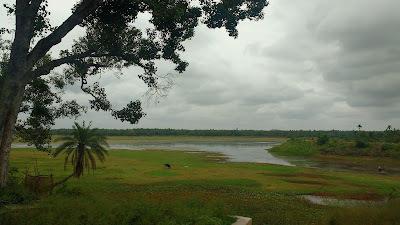 Other places like Belavadi, Doddagaddavalli and Mosale are scattered near Hassan. 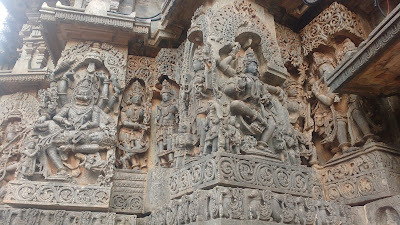 Belur was the first capital of the Hoysalas and the Chennakeshava Temple was built to commemorate their victory over Cholas at Talakadu. The temple was commissioned in the early part of the 12th century and took about a century to finish. 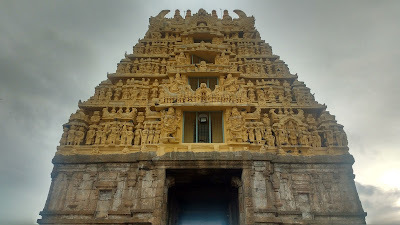 Along with the main temple, there are multiple smaller temples all enclosed by a high wall and accessed by an entrance gopuram (tower) on the eastern side. Wiki link for the detailed description. I was not able to take many pictures here with the fading light. 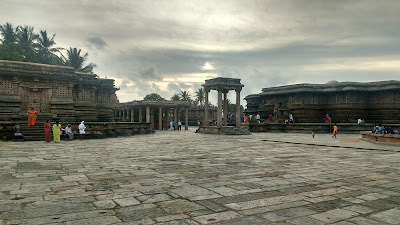 The Hoysala capital was shifted from Belur to Halebidu (earlier Dwarasamudra) in the early half of the 12th century, after the commencement of the Chennakeshava Temple construction. 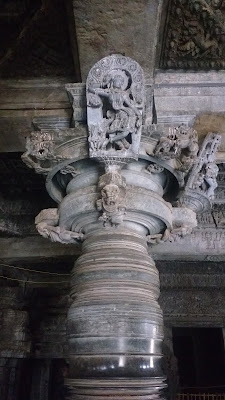 The new capital was to have its own grand temple - the outcome being the Hoysaleshwara Temple, the grandest of the Hoysala temples. 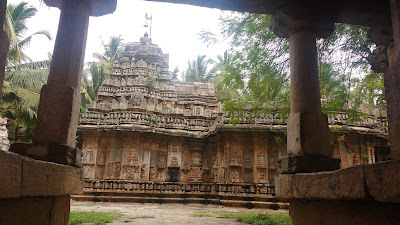 The main temple has two shrines - dedicated to Hoysaleshwara and Saantaleshwara, both forms of Shiva. 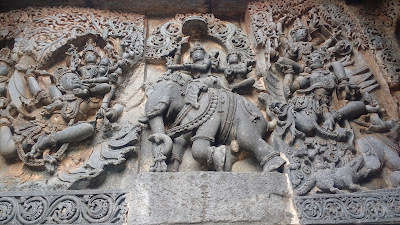 There are two corresponding Nandi mantapas with a smaller temple to Surya next to the southern mantapa. Wiki link for the detailed description. 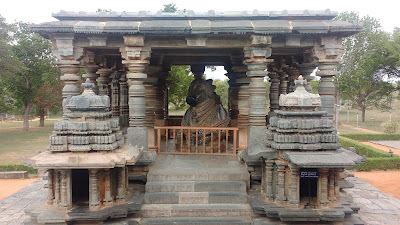 The Temple of Somanathapura, on the banks of the mighty Kaveri, was built in the early part of the 13th century. 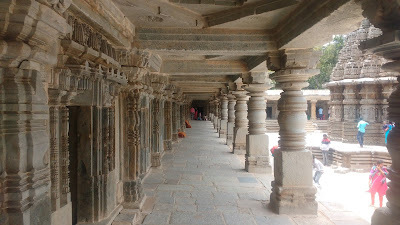 The temple has three sanctums with their independent passages connected by a common navarang hall. 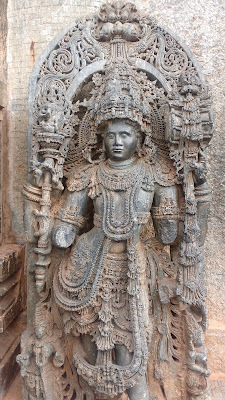 The temple is smaller than the ones at Belur and Halebidu, but makes up with the intricacy of the sculptures. As the name suggests, this temple has five Shiva shrines connected by a common pillared hall. There are two entrances in front of the second and third sanctums. 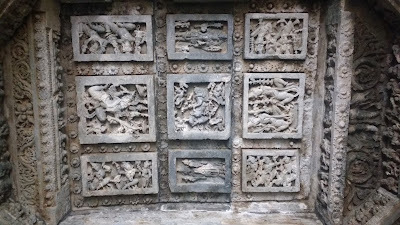 The external walls are moderately decorated as compared to the other temples described above. The sculptures are also of a comparatively smaller size. The temple dates to a period in the middle of the 13th century. This is an old and dilapidated temple located on the banks of a water reservoir. The temple was closed when we arrived and hence could not get a good look inside. 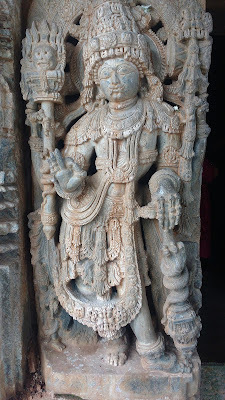 The sculptures of the Hoysalas are simply spectacular. 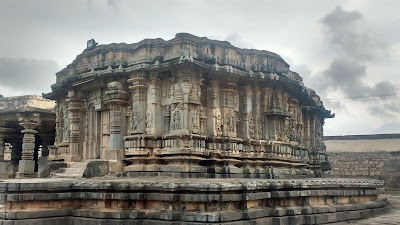 Their style has influenced temple atchitecture in Karnataka in a huge manner. 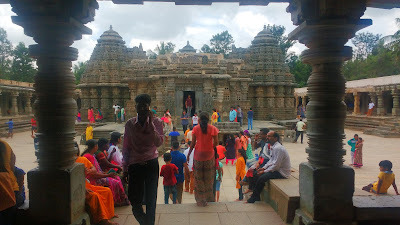 Even the Bhoga Nandeeshwara Temple near Bengaluru bears their mark. 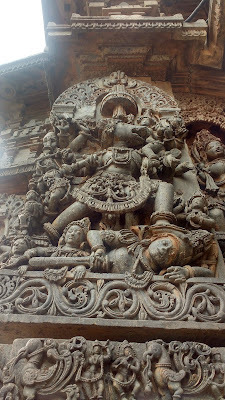 Unfortunately, I've not been able to cover quite a few sites, nor give Halebidu and Belur the attention it deserved. This of course, calls for a re-trip! Swami, in his subtle form, drives his devotees to work for good and quality health care for all in an unbiased manner. Visit our website to understand what comprehensive, loving and preventive health care means. The team under the drive of his subtle form continues to work for providing quality healthcare to the deserving people. Take a look at our initiatives on health care front. His passionate devotees continue to serve the needy people in a selfless manner.